This Wednesday, on December 12, a day four months in the making, I received what is probably my most hotly anticipated Christmas present: the Surface RT. I have spent several hours a day since then exploring it and wanted to share some of my initial thoughts. I wasn't really sure I would like the Touch Keyboard; I was skeptical about its thinness. However, after about an hour with the device I began to get more comfortable with it and can now type almost as fast as I can on a real keyboard. I am really impressed with its responsiveness. Squee! My shiny new surface! 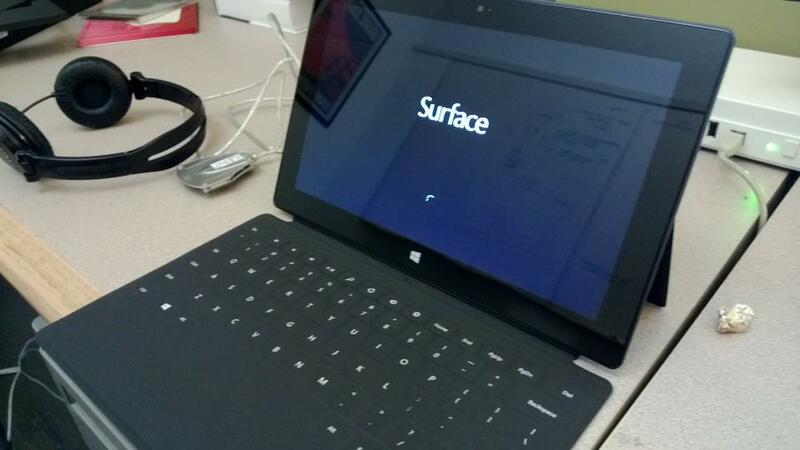 As for the kickstand, it works great for putting your Surface in 'pseudo laptop' mode on a hard surface. Even when reclining in my favorite chair and resting it on my legs, the keyboard and angle work well. A hard surface does make it easier to type lightly on the keyboard but all in all this is a very usable position from which to type. One other hardware/software combo that works so smoothly is the built in forward facing camera and Skype. The calls I've made so far have had much better quality than my desktop PC and webcam combo, with less feedback and a clearer picture. Awesome! Microsoft Account: I love using my Microsoft account to sign in, sync music, pictures, and documents across all my devices using skydrive. Signing in this way also syncs your settings across other Win8 devices, which makes things seamless when transitioning from one device to another. Xbox: Similarly, signing into the Games hub with my Xbox ID means all my achievements track across my devices. Also, the platform for games is solid; I tried a new game called Adera (a very entertaining game, by the way!) and found the graphic-heavy playback smooth and very performant. Switching between apps: I thought the charms and gestures one can use to navigate between apps might be hard or awkward to learn, but I found myself fairly up to speed within 30 minutes of using the device. I've learned a few tricks since then and it is only getting better! Being able to switch between desktop mode and the Start screen with all my live tiles is so handy. Battery life: this device lasts me all day without charging. There are days when I forget to plug it in overnight and it is awake and ready for me in the morning. I am leaving on vacation next week and plan to bring the Surface with me. I'm so excited to have a great replacement for my netbook!